Here's my card for the current sketch at Match the Sketch. 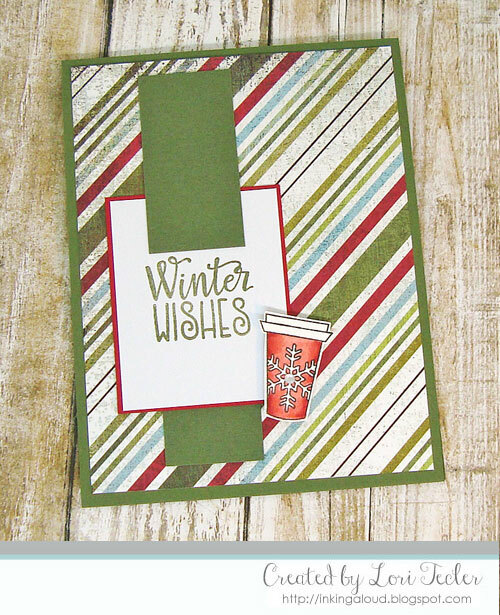 I used Verve's Coffee Helps stamp set for my coffee themed winter design. The color inspiration came from the festive striped paper I found in my collection from a long, long time ago. I paired it with a coordinating artichoke green cardstock strip, cut in pieces to frame the "winter wishes" sentiment. The sentiment was stamped in green pigment ink to match the cardstock and matted on red for a nice pop. I accented the sentiment panel with one of the set's coffee cups. After coloring the snowflake to go cup with red Copic markers, I carefully cut it out, then adhered it to the sentiment panel using foam tape for dimension. It's hard to see in the photo, but I added a teeny, tiny clear crystal to the center of the snowflake on the cup for a bit of sparkle. The finished panel was adhered to a coordinating green card base. I absolutely love this card Lori!